Last week, Facebook held their Mobile Event during which they announced several new upcoming features. One of the most interesting among these was ‘Deals’, a feature that could help local businesses get noticed by more users on Facebook. Facebook launched Places in August this year. The service paved the way for Deals by allowing users to find out if their friends were in the same locality as themselves. Deals, is a sort-of extension of Places. Now, when a user signs in to Facebook, the local businesses in that area will be able to inform the user of some of the special deals that they are offering to their clients. Users can then also inform their friends about these deals. In order to find these deals, the user has to touch Places and then check in on touch.facebook.com or via the latest version of Facebook for iPhone. 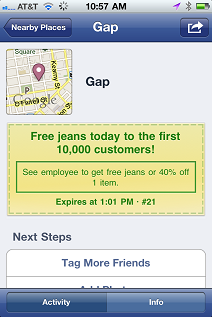 Local businesses that are offering deals will be indicated with a yellow icon by the side. The user can then “touch” the place and check in to claim the deal by showing the phone at the concerned outlet. Charity deals – where the business will donate to a specific cause when the user checks in. Facebook has already tied-up with over 20 retail chains and they expect to host about 20,000 deals in the near future. The world’s largest social network is no stranger to borrowing other peoples’ ideas and incorporating them into their own service. They’ve been accused of blatantly copying Twitter with their News Feed feature. Now, the new services are being likened to very similar offerings from Foursquare, Gowalla and Groupon.